Hiking in the Great Plains is a lot of fun. There are surprises all over. While most of the land is basically flat and there are no mountains at all and few trees, we have canyons, creeks and hills galore. The outlaws loved to hide out here. The lawmen had quite a job to comb this wilderness. As a child, I trekked the back pasture often with an old canteen and my trusty old dog. I'd 'discover' all kinds of fun things. My children carry on that tradition, bringing in finds from their adventures. Each lizard, salamander, or horned-toad is the most beautiful one yet! Every piece of petrified wood or fossil is the most amazing. We have quite a collection! Did you know where there are established hiking trails there is an "Etiquette" for hiking? It's hard for me to imagine. Right-of-Way goes to those walking uphill. Slowest hiker leads to set the pace everyone can follow. The most experienced hiker takes rear to insure everyone is safe and stays together. Unless you're in bear country, it's polite to be quiet. Okay, I have to admit that some of these seem ridiculous to my family (and probably most of my neighbors). It's not that we don't understand the reasoning on overpopulated hiking trails. Out here though... Well, we don't have dangerous animals to worry about "feeding" so we leave the lunch leftovers for the bunnies, birds, deer, & coyotes. (We may give it to the trusty old dog we brought along though.) We do pick up and collect rocks, plants, and even animals along the way. So far there is no shortage of any out here and most of the time we're hiking on our own private land. We enjoy the quiet of the countryside, but we may be sighted (or heard) singing a boisterous tune while traipsing about. We will try not to spook the neighbor's cattle though. I had a pickle of a time finding a few books for this linkup, but ran into these two treasures. We have an Amelia Bedelia book or two on Kindle and they are fun. I'm also excited to have found "Hiking with Jesus". That's the very best way to go hiking! "Amelia Bedelia and her entire class are going on a hike. Amelia Bedelia is excited. What will she find for the classroom nature table? Amelia Bedelia spots squirrels, deer, birds, and insects along the trail. She has fun splashing with her friends in a stream, collecting leaves, and having a picnic. Best of all, her nature table find is a surprise in more ways than one! An easy-to-read book about friendship and exploring the natural world that is just right for beginning readers." "Take a "nature hike" through the Bible and discover all the wild and wonderful things that God made for our happiness. Through the eyes of each inspired author you'll learn about nature's great God. And whenever you see a piece of nature in the real world, you'll remember the deeper meaning. So put on your hiking boots. We're going on a truth safari!" 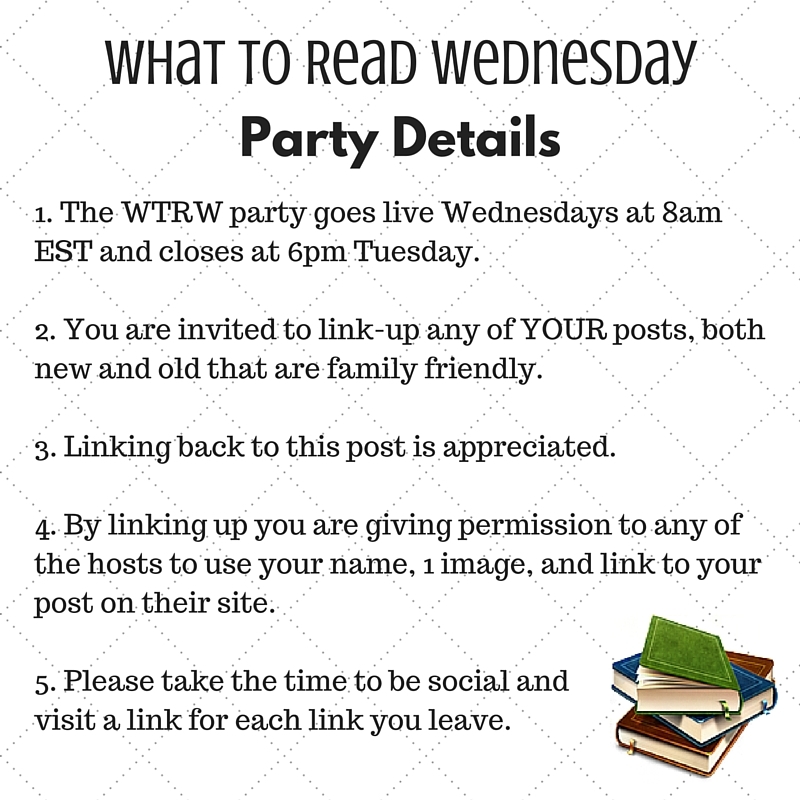 Favorite from last week's What to Read Linkup! I'll be back later to check out all the fun posts! Thanks for your efforts in building community! And, by the way, five years ago my family and I visited the mid-west, and we loved the beauty and the HUGE difference from our scene here in Maine! I didn't know there was an official etiquette rule that stated: "right-of-ways" goes to those going uphill. Makes sense. I wish people in a city would learn that right-of-ways goes to a woman pushing a double stroller with three small kids in it. Eeeek! City living is way out of my realm. I'm usually happy if the farmers out here slow down enough to not blow dust in our faces on our dirt roads. Most are courteous, but the drunk cowboys are a real problem. The oil companies are usually the most polite. If one of their drivers is the least bit improper, all we have to do is call the company and it's dealt with swiftly. I love country living!